Today is The Cottage Colors Party and the color for the month of May is Yellow. 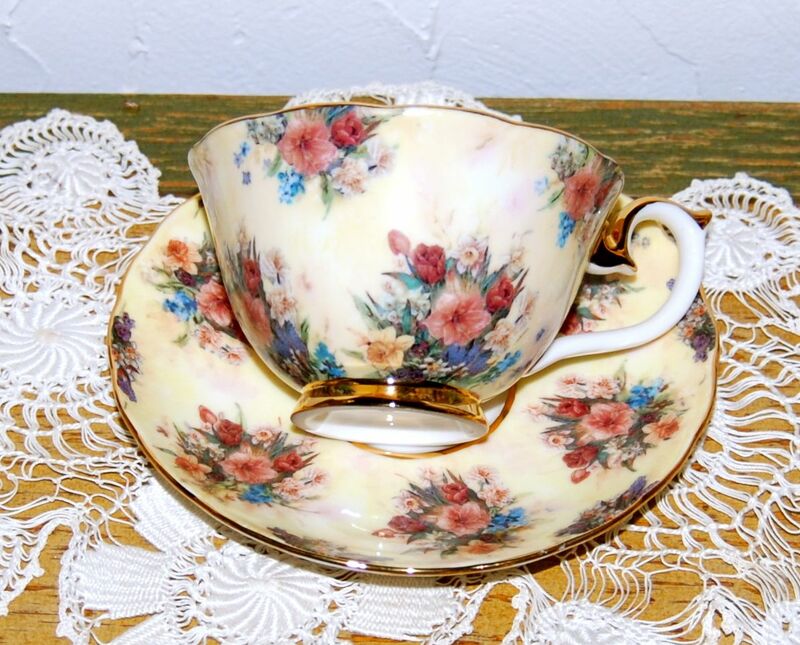 I'm sharing a beautiful Teacup and saucer that is part of the Lena Liu's Glorious Chintz collection and the name of this one is "Enchantment". There were more in the set than I collected but I have about 6 or so of them. This whole collection was just wonderful and Chintz is my favorite in china. 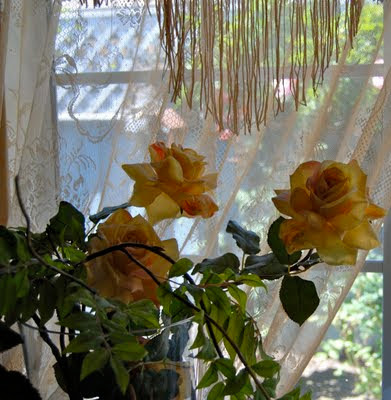 I included my favorite roses which are silk and sit in front of a window in my family room. I will have to photograph the complete vase one of these days so you can get the full impact of these beauties. I hope you are all having a wonderful week and had a relaxing weekend. I'm also joining Martha's Favorites for Tea Cup Tuesday so you all can go check out the Tea Ladies and all their beautiful Tea Cups! Marilou, oh, my, they are beautiful!!! What is the name of the roses? I love your tea cup & saucer, also. Oh, I am loving your adorable tea cup! LOVE it! I adore chintz and swoon whenever I see it. Pretty roses too. Yellow is such a cheery color and perfect for may. I love your tea cup, so pretty with it's floral pattern and elegant handle. Thank you so much for sharing it with us. Absolutely beautiful! The colours are wonderful and your roses are beautiful. Beautiful tea cup and roses! Happy Tea Day! Your blog is always so PRETTY!!!! Just stoppin' by to say Hey! Hi Marilou! What pretty yellows. You can almost smell thar rose. So happy you could join us for the ECS Cottage Colors Party! Marilou Ilove roses...especially yellow roses! I sooo need to share in the ECS Cottage Colors Party next month...as I am totally enjoying visiting all the girls...but your bloggie is always one of my favorites!